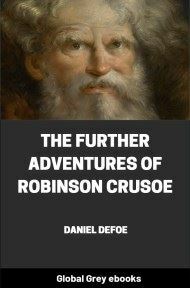 The Further Adventures of Robinson Crusoe is a novel by Daniel Defoe, first published in 1719. Just as in its significantly more popular predecessor, Robinson Crusoe (1719), the first edition credits the work's fictional protagonist Robinson Crusoe as its author. 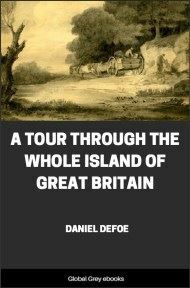 It was published under the considerably longer original title: The Farther Adventures of Robinson Crusoe; Being the Second and Last Part of His Life, And of the Strange Surprising Accounts of his Travels Round three Parts of the Globe. 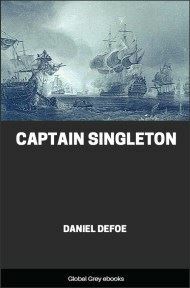 Although intended to be the last Crusoe tale, the novel is followed by a third and final novel involving the character by Defoe entitled Serious Reflections of Robinson Crusoe (1720). That homely proverb, used on so many occasions in England, viz. “That what is bred in the bone will not go out of the flesh,” was never more verified than in the story of my Life. Any one would think that after thirty-five years’ affliction, and a variety of unhappy circumstances, which few men, if any, ever went through before, and after near seven years of peace and enjoyment in the fulness of all things; grown old, and when, if ever, it might be allowed me to have had experience of every state of middle life, and to know which was most adapted to make a man completely happy; I say, after all this, any one would have thought that the native propensity to rambling which I gave an account of in my first setting out in the world to have been so predominant in my thoughts, should be worn out, and I might, at sixty one years of age, have been a little inclined to stay at home, and have done venturing life and fortune any more. Nay, farther, the common motive of foreign adventures was taken away in me, for I had no fortune to make; I had nothing to seek: if I had gained ten thousand pounds I had been no richer; for I had already sufficient for me, and for those I had to leave it to; and what I had was visibly increasing; for, having no great family, I could not spend the income of what I had unless I would set up for an expensive way of living, such as a great family, servants, equipage, gaiety, and the like, which were things I had no notion of, or inclination to; so that I had nothing, indeed, to do but to sit still, and fully enjoy what I had got, and see it increase daily upon my hands. 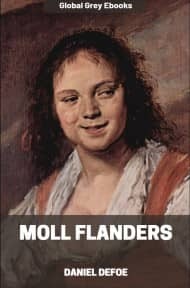 Yet all these things had no effect upon me, or at least not enough to resist the strong inclination I had to go abroad again, which hung about me like a chronic distemper. In particular, the desire of seeing my new plantation in the island, and the colony I left there, ran in my head continually. I dreamed of it all night, and my imagination ran upon it all day: it was uppermost in all my thoughts, and my fancy worked so steadily and strongly upon it that I talked of it in my sleep; in short, nothing could remove it out of my mind: it even broke so violently into all my discourses that it made my conversation tiresome, for I could talk of nothing else; all my discourse ran into it, even to impertinence; and I saw it myself. 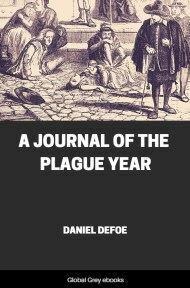 I have often heard persons of good judgment say that all the stir that people make in the world about ghosts and apparitions is owing to the strength of imagination, and the powerful operation of fancy in their minds; that there is no such thing as a spirit appearing, or a ghost walking; that people’s poring affectionately upon the past conversation of their deceased friends so realises it to them that they are capable of fancying, upon some extraordinary circumstances, that they see them, talk to them, and are answered by them, when, in truth, there is nothing but shadow and vapour in the thing, and they really know nothing of the matter. For my part, I know not to this hour whether there are any such things as real apparitions, spectres, or walking of people after they are dead; or whether there is anything in the stories they tell us of that kind more than the product of vapours, sick minds, and wandering fancies: but this I know, that my imagination worked up to such a height, and brought me into such excess of vapours, or what else I may call it, that I actually supposed myself often upon the spot, at my old castle, behind the trees; saw my old Spaniard, Friday’s father, and the reprobate sailors I left upon the island; nay, I fancied I talked with them, and looked at them steadily, though I was broad awake, as at persons just before me; and this I did till I often frightened myself with the images my fancy represented to me. One time, in my sleep, I had the villainy of the three pirate sailors so lively related to me by the first Spaniard, and Friday’s father, that it was surprising: they told me how they barbarously attempted to murder all the Spaniards, and that they set fire to the provisions they had laid up, on purpose to distress and starve them; things that I had never heard of, and that, indeed, were never all of them true in fact: but it was so warm in my imagination, and so realised to me, that, to the hour I saw them, I could not be persuaded but that it was or would be true; also how I resented it, when the Spaniard complained to me; and how I brought them to justice, tried them, and ordered them all three to be hanged. What there was really in this shall be seen in its place; for however I came to form such things in my dream, and what secret converse of spirits injected it, yet there was, I say, much of it true. I own that this dream had nothing in it literally and specifically true; but the general part was so true—the base; villainous behaviour of these three hardened rogues was such, and had been so much worse than all I can describe, that the dream had too much similitude of the fact; and as I would afterwards have punished them severely, so, if I had hanged them all, I had been much in the right, and even should have been justified both by the laws of God and man.